Since reading Ishmael, I have spent a lot of time looking at how Ishmael impacted other people. After looking at this population graph, I started wondering what other people thought about population after having read Ishmael. 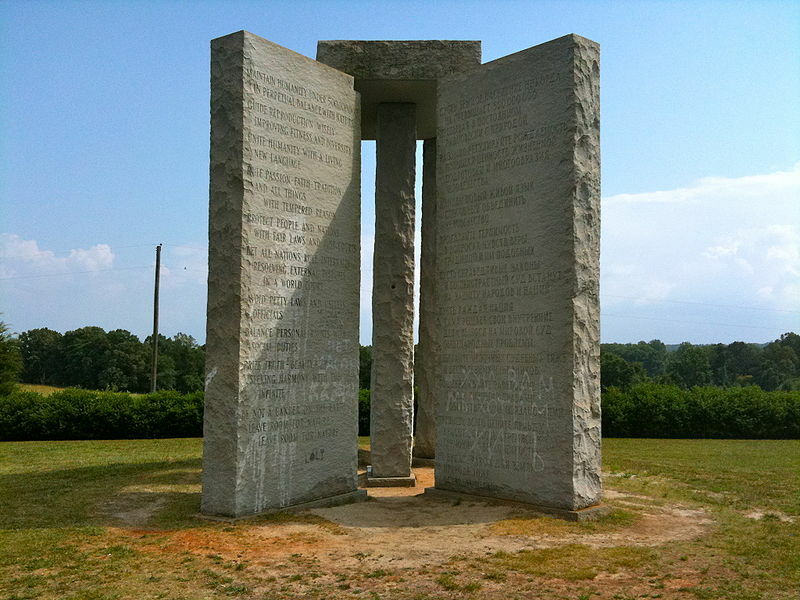 I came across these photos of the Georgia Guidestones. They have inscriptions in them from several different languages and four ancient dialects. They list rules or “guidelines” that the human race should follow. I’m not sure if we really should listen to what they say, but I found them kind of interesting. There are a few people who think that they were created after someone read the Story of B, but looking at dates, that’s not possible unless someone in the future invented time travel. Still, it lists a lot of things that seem to be brought up in both Ishmael and The Story of B, including population control. The “be not a cancer on the earth” portion really rings true in our current state. The engraved tablet seems to list all of the fundamental actions we should NOT take in order to successfully survive on the planet, and yet, it seems that we have completely ignored it. I can’t say that the principles on this stone tablet are completely valid and I’m not trying to say we should follow all 11 rules, but taking it into consideration might shed some light on our current situation. Maybe we can get more people to realize that we have a problem here and get them on board to help repair the damage we have already created. Previous Previous post: How has Ishmael affected you?